A symbol of prosperity and longevity. 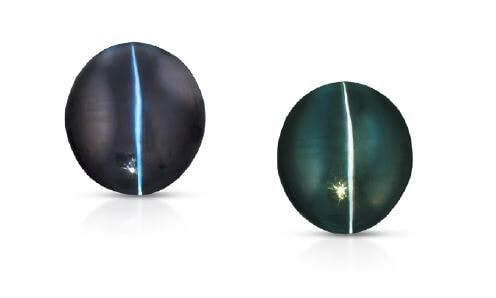 Alexandrite is a very rare variety of the mineral chrysoberyl that changes color in different light sources. Discovered in 1830 by miners in the Ural Mountains of Russia, these red to green color changing stones resembled the colors of Imperial Russia's national military. The find was named "alexandrite" after the Emperor Alexander II. Its extraordinary ability to change color takes place when it is viewed under different lighting conditions. 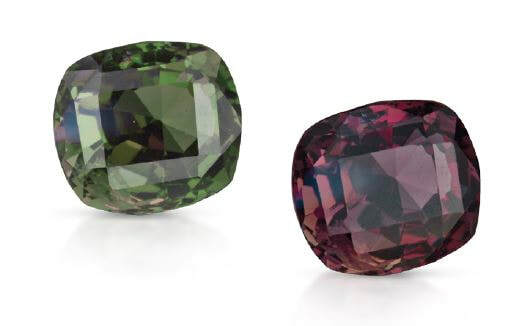 For this reason, the color-changing phenomenon is called "the alexandrite effect." The most-prized alexandrites show a vivid green to bluish green in daylight and fluorescent light, and an intense red to purplish red in incandescent light. 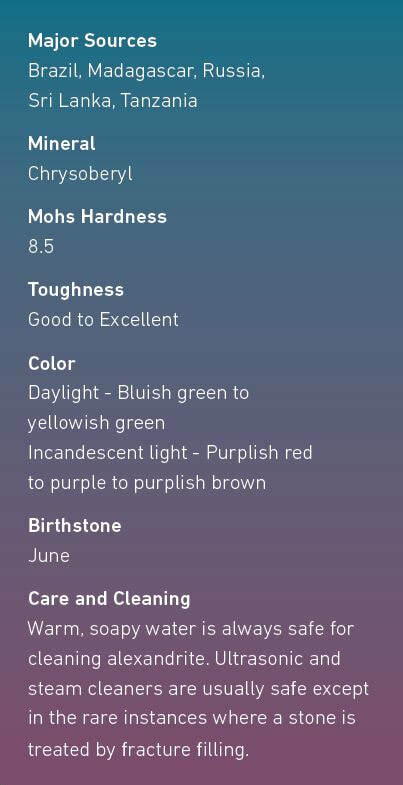 They have medium to medium-dark tone and moderately strong saturation. This color change created the phrase, "emerald by day, ruby by night." A change in hue is what makes this stone unique. Other examples of color change can be green to purple and yellowish green to purplish brown. Alexandrites tend to contain few inclusions. There's a dramatic rise in value for clean material with good color change and strong hues. A cat's-eye phenomenon occurs when needle-like inclusions are oriented parallel. Some of the finest color alexandrite came from Russia, although today those historical mines produce very little. Alexandrite may be found in Sri Lanka, East Africa, India and Brazil, but fine qualities are exceptionally rare and valuable. 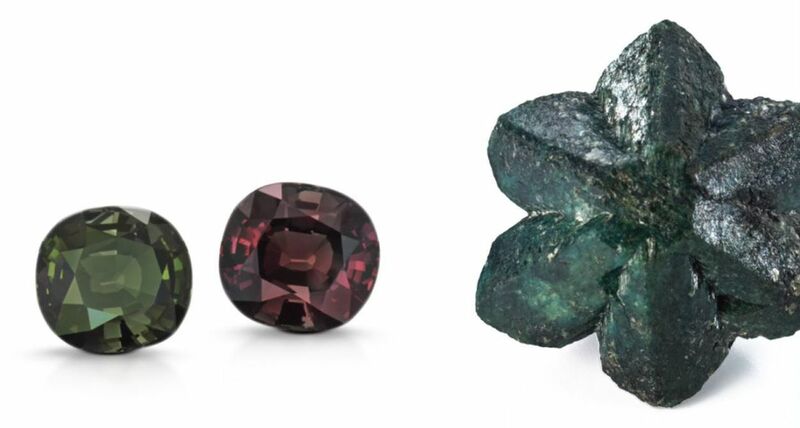 Because of its scarcity, especially in larger sizes, alexandrite is one of the more valuable colored gemstones. Alexandrite is not usually treated except where there are surface-reaching fractures that can be filled. This gem's transformation may be so striking that the color-change phenomenon itself is often called "the alexandrite effect." When certain types of long, thin inclusions are oriented parallel to each other, they can create an additional phenomenon called chatoyancy, or the cat's-eye effect. That, coupled with the color-changing phenomenon, makes this gem particularly unique.